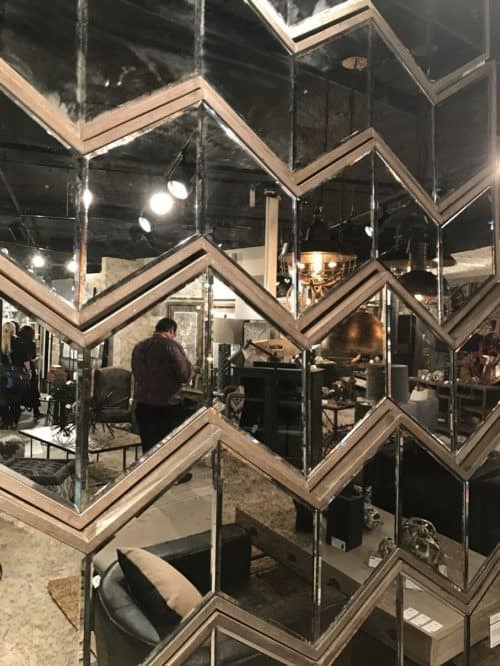 High Point Market. I feel so lucky we are not far from High Point where largest home furnishings show happens twice a year. This Spring the weather was not welcoming, it was pouring all three days I attended the Market but, as always, it was well worth going. I will share with you my observations I and maybe we can incorporate them or similar fun designs in your home. So, sit back and enjoy! Today one can pick a finish for lighting, knobs, frames to her/his personal liking. I saw black, brass, nickel, painted white, bare wood, chrome. So many options in all variety of styles to work in many settings. So “Yay!” to the freedom of the choice – there is no right answer, if you ask me! 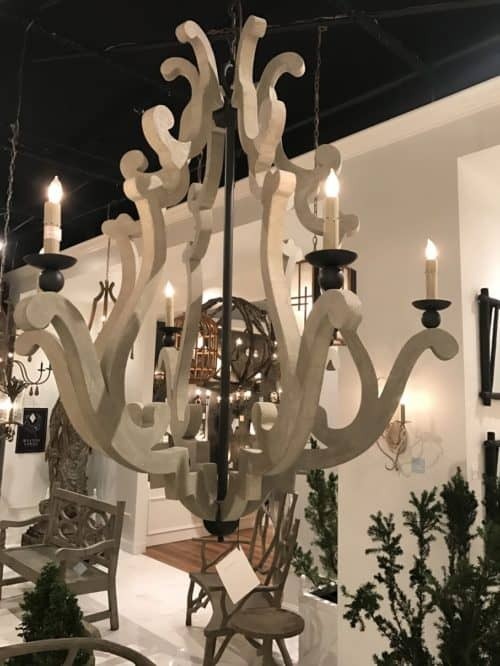 Modern meets traditional meets rustic in this beautiful chandelier. Modern twist – round plain drum accented by golden leaves and crystals! 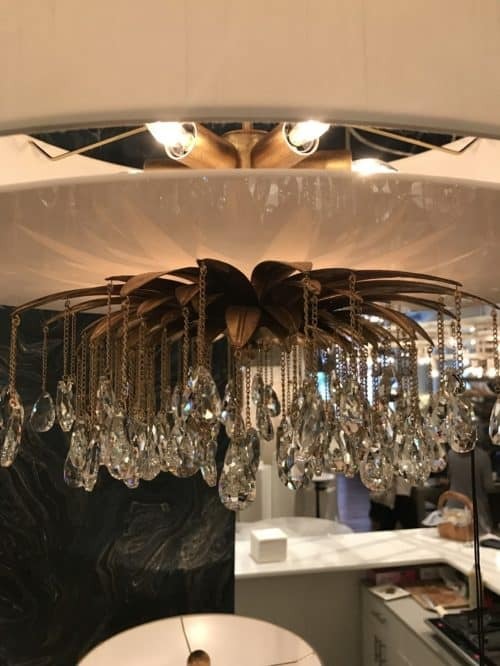 Glamorous chandeliers in golden and silver finishes. 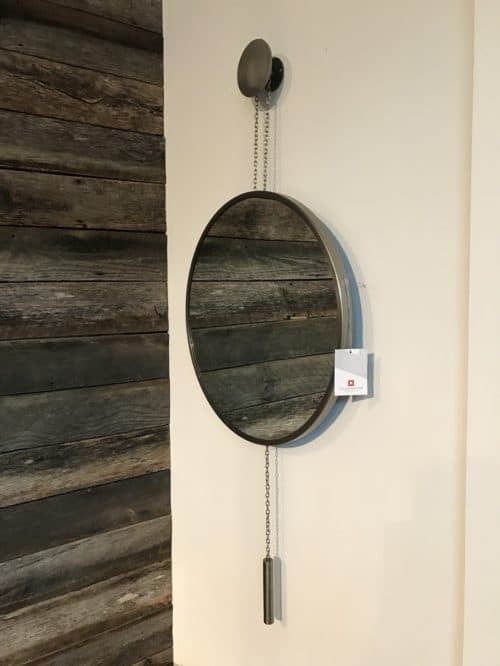 The knob and the chain add more interest to simple round mirror in brushed nickel frame. 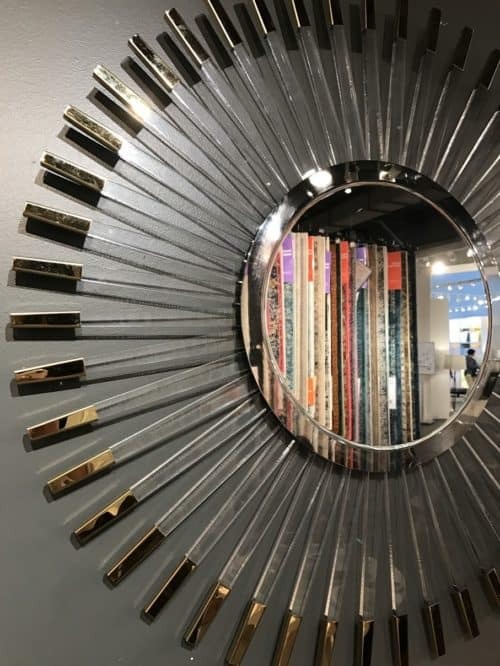 Love the combination of textures on this golden mirror. 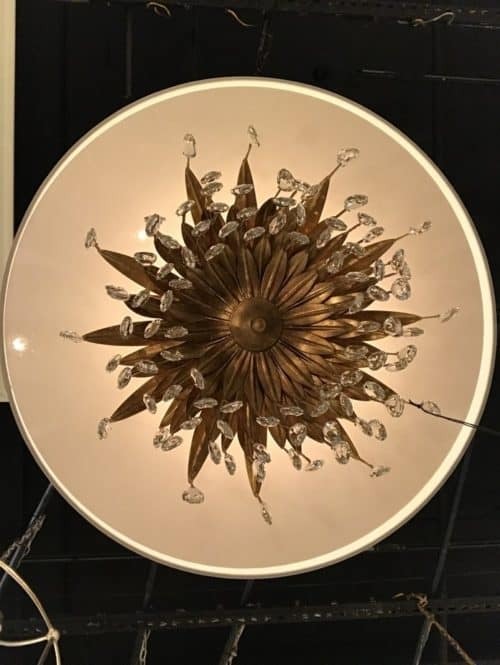 This starburst mirror with acrylic rays and golden tips will steal the attention! 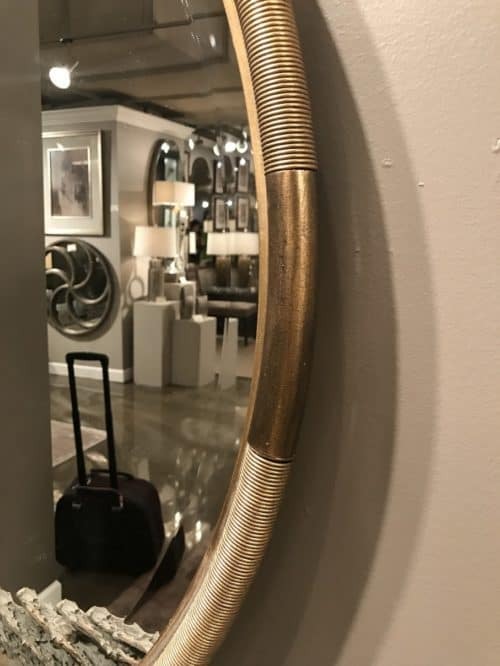 Not your standard framed mirror! Wood frame and chevron pattern will make a wall stand out. 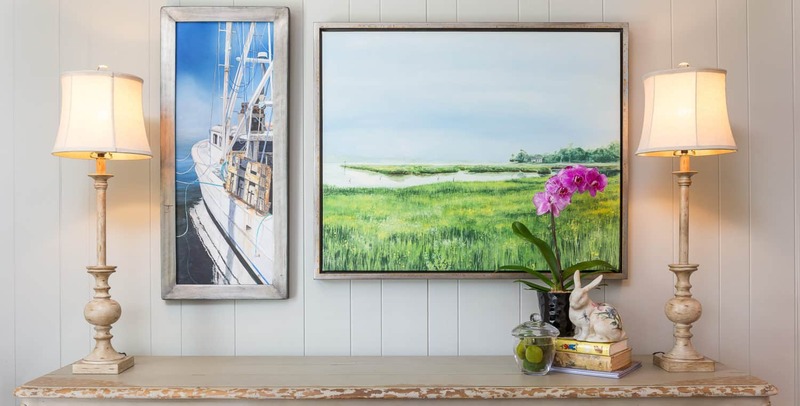 I certainly appreciate the variety and creativity for wall décor ideas. 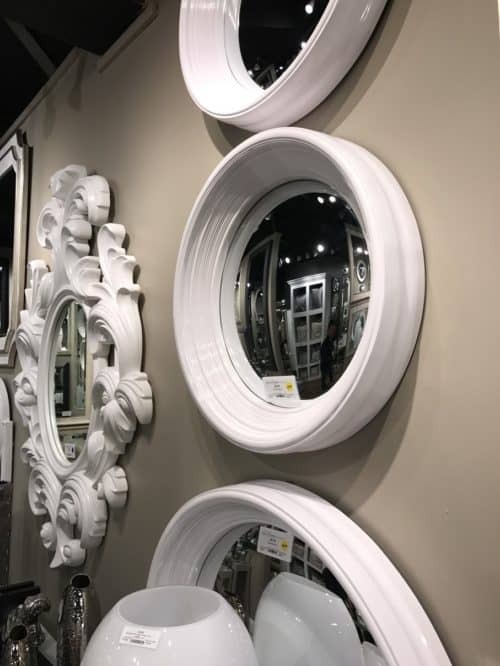 Proven art and mirrors, as well as whimsical and unique wall art to create conversation spots here and there. 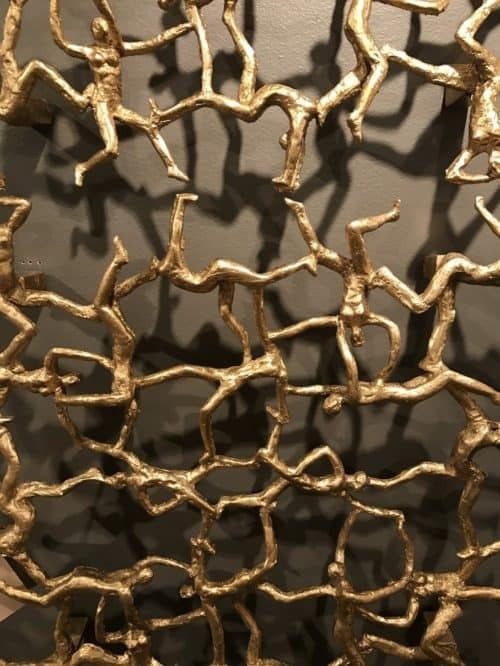 Wall sculptures add a lot of dimension and texture to the wall space. Beautiful garden made of metal. So creative and made in North Carolina. How fun these guys are? Perfect sizes to fill a big empty wall. 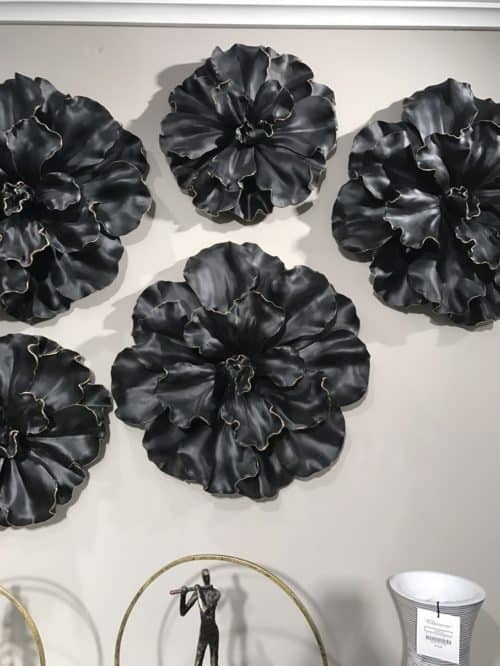 Black flowers with golden accents. 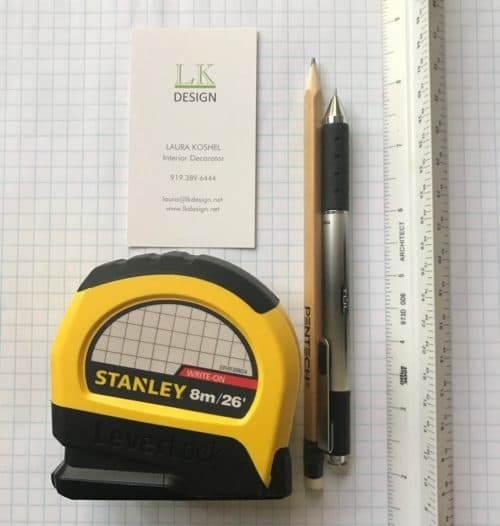 Shapes – hexagon & octagon. 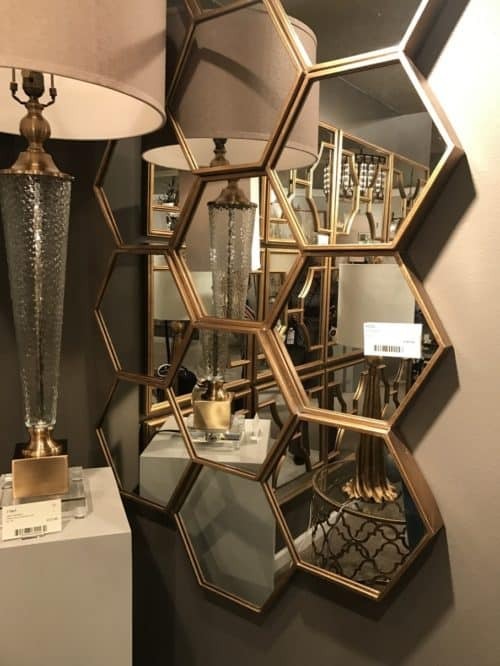 The hexagon and the octagon kept popping up in every other showroom. Tables, mirrors, fabrics. I love these shapes – circle meets square! Black hexagon tables bunched up. Love! Bunch the mirrors on the wall to fill as much space as you need. 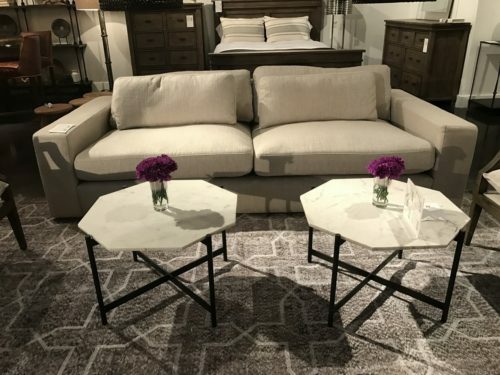 Two marble top octagon tables. Everybody can reach – place two and you and your guests will be comfortable with their drinks! And easy maintenance! Shimmering hexagons on this upholstery fabric. So luxurious! 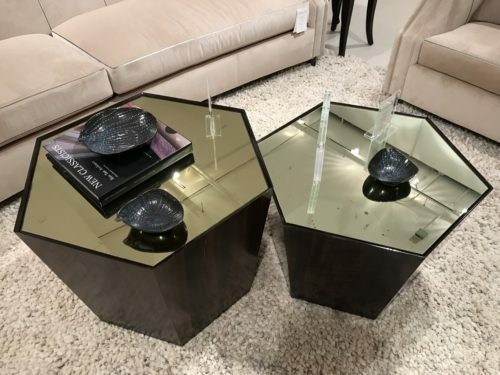 Now, if you have a gorgeous chandelier on the ceiling, let’s reflect it in these mirrored hexagon tables! Upholstery – Backs for floating pieces. 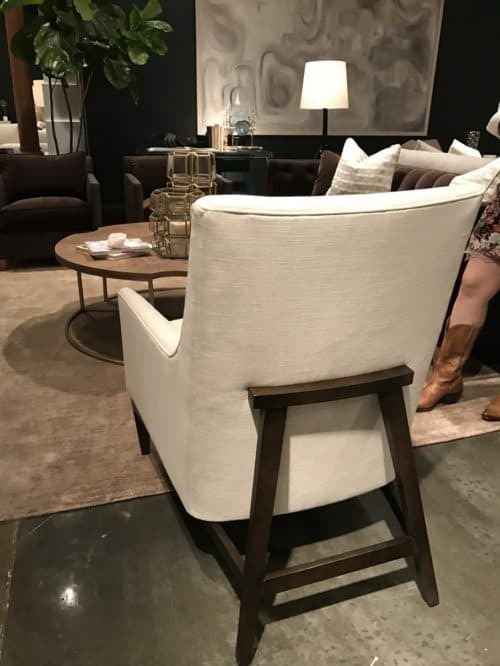 More and more we see upholstery lines carry pieces that have more interest on the back of the pieces. 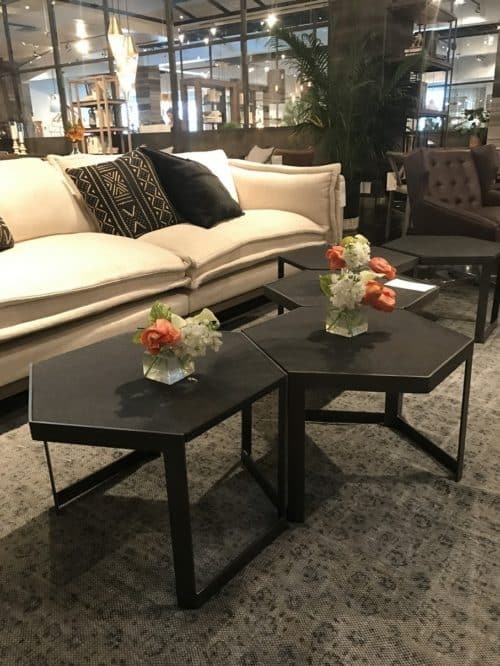 These are perfect for rooms where you have furniture floating in the middle and details adorn back which would be otherwise big flat surface. It is adding visual interest to the pieces made in solid fabrics, don’t you agree? Lovely channel tufting on the back of this pretty sofa will make your eye happy every time you see it. 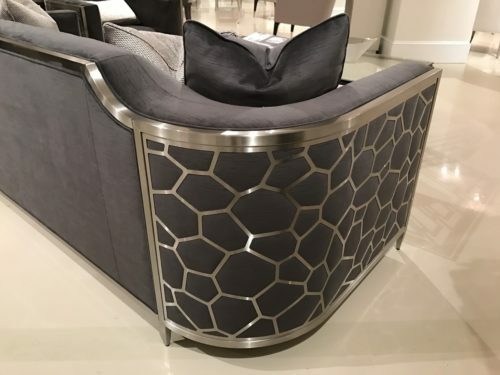 How about this curved sofa with the metal accents? The wood frame helps to visually break the solid back of this chair. Upholstery – modern, slim arms. 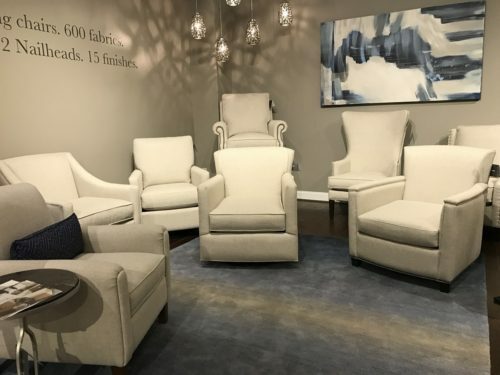 Modern style is gaining more popularity and most upholstery companies will now carry couple of collections with cleaner lines. 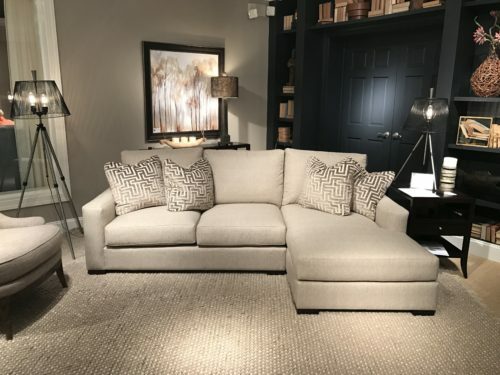 Slim arms on sofas and chairs allow for more seat room and have a less bulky look. 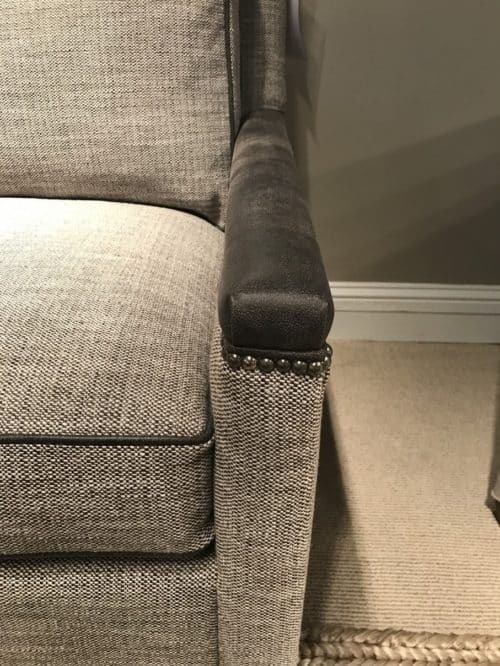 Slim arms make lines clean, add more seat room and keep the chair scale small. I find this to be a great combination for the traditional twist on a modern frame. Clean lines combined with nail details and fabric/leather combination gives this modern frame a traditional twist. Love it! 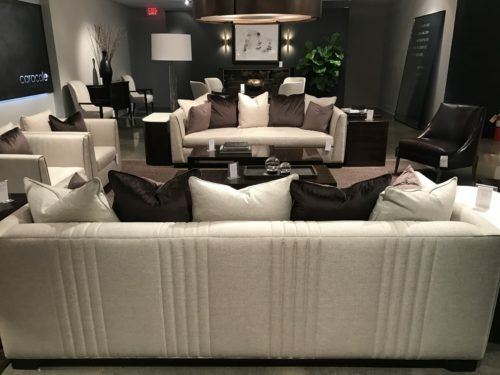 Upholstery – it is all about the fabric and option choices. 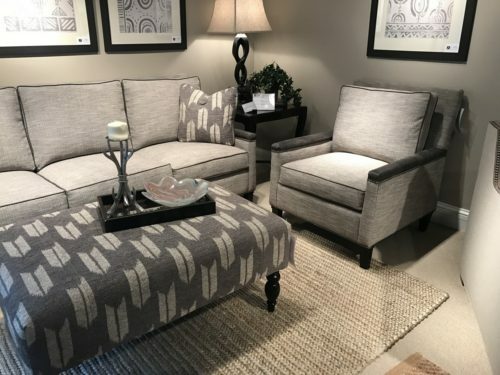 I found this great example of how the same sofa frame can be dressed in two different ways to cater to two different design styles – contemporary and traditional. 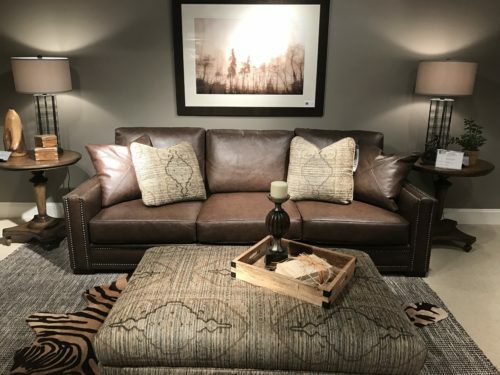 Doesn’t this sofa with nails and leather look more traditional to you but yet feels that it is modern traditional? Leather and nails make this frame look more traditional. But throw a fabric on it – and voila! You have a more casual, modern look! 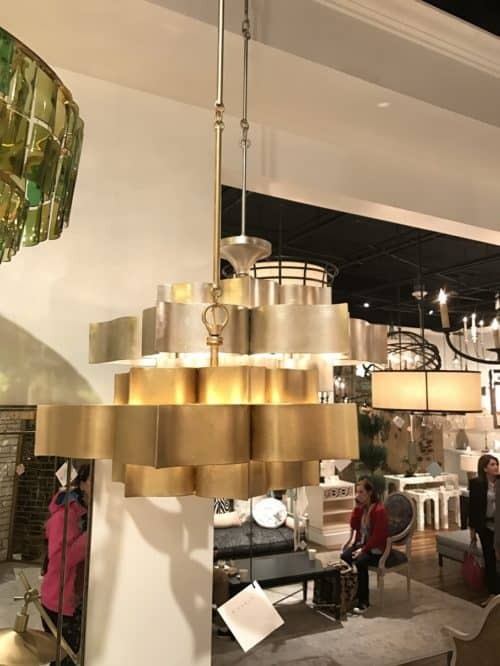 With all inspiration and finds from High Point Market we are ready to take your project on! So what can we work on together today? We’ll call you back to discuss your project – just fill out the form and you will hear from us soon! 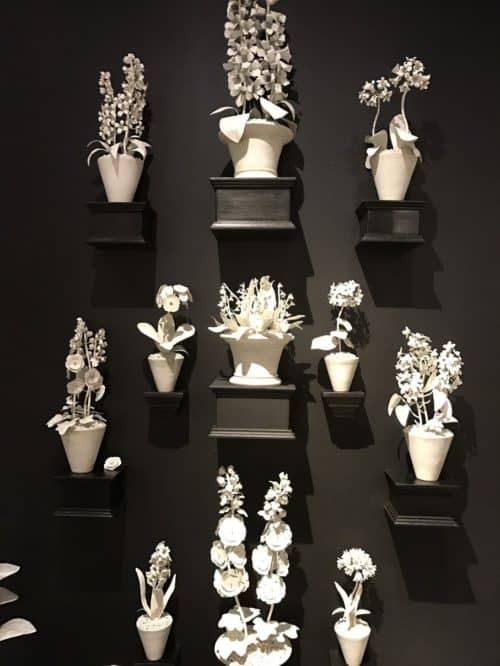 If you would like to keep reading – here are few words on Spring 2018 High Point Market. ← Motorize or not to motorize? 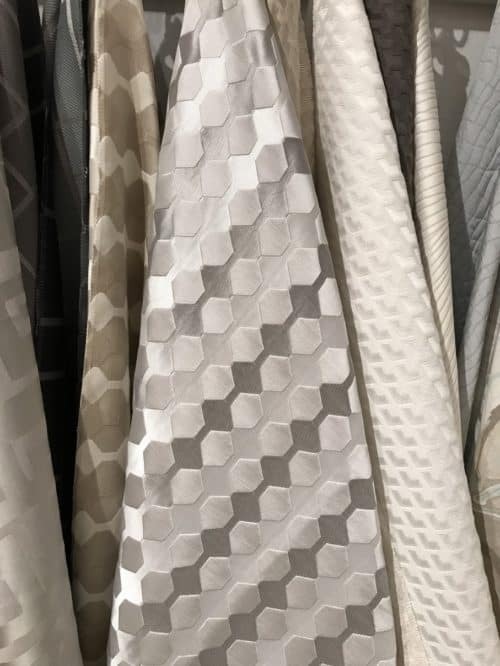 !… Shades of all kinds… From Window Coverings Expo.